Whisk together 3 tablespoons of walnut oil with lemon juice, minced shallot, salt and pepper to make a vinaigrette. 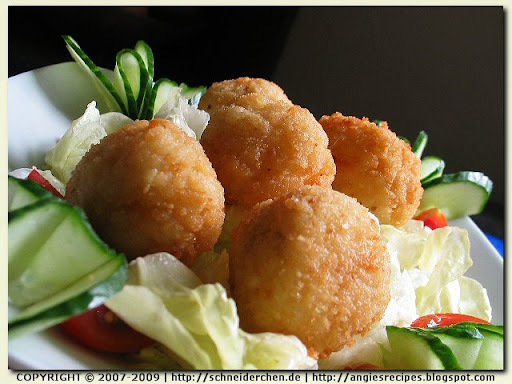 Coat each goat cheese round with walnut oil and then the bread crumbs, patting the crumbs to adhere. Combine the greens and the walnuts in a large bowl. Add in enough of the vinaigrette and toss well. Adjust the seasoning and divide among two serving plates. Heat a nonstick skillet over medium heat. Add in olive oil. When the oil is hot, add the goat cheese rounds. Cook until nicely browned, about 30 seconds. Turn and cook the other side. Do not allow it to burn or melt. Transfer the goat cheese to the plates, placing 2 or 3 atop each salad. Sprinkle the cheese with freshly ground pepper and garnish with grape wedges. Whey or milk plasma is the liquid remaining after milk has been curdled and strained. It is a by-product of the manufacture of cheese or casein. Sift the flour and baking powder together in a mixing bowl. Line a 30x40-cm baking tray with parchment paper. Preheat oven to 175C/350F. 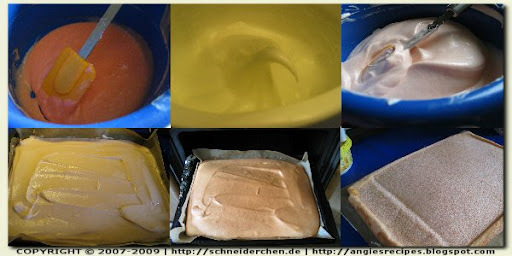 In another bowl, place together the whey, strawberry icing powder and corn oil. Whisk until the mixture is emulsified. Sift in flour mixture and blend until just combined. Add in egg yolks and fold until smooth. Pour the cake batter into the prepared baking tray and spread the surface even. Bake for 15 minutes. Remove, cool briefly, and invert the cake onto a new parchment paper. Carefully peel off the the paper liner and then invert again the baked side-up to cool on a wire rack. Trim the edges of cake. Spread the surface with whipped cream and roll it up. Chill for about 1 hour and slice. 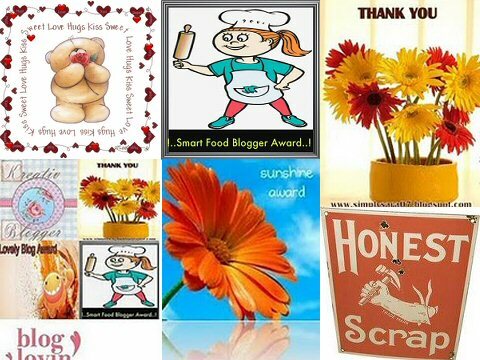 Last, but not the least, I want to thank SHAHANA@ME N MY APRON sharing all these beautiful awards with me. An irresistible combination of the delicate flavors of the Alaska pollock, the earthy scent of the bell pepper and the rich buttery savour of the pine nuts makes this fish dish unbeatable! Cut the fish fillets into the small cube size of pine nuts. Mix the fish cubes with the marinade and rest for 30 minutes. 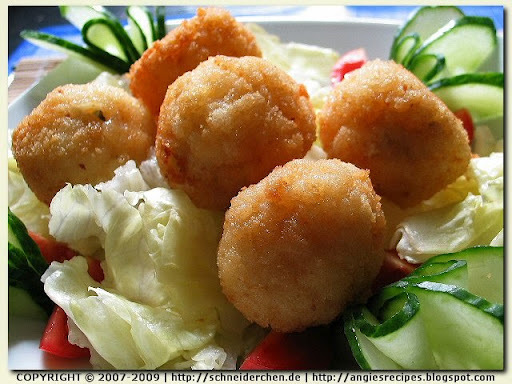 Cut the cucumber, bell pepper and spring onion into the size of the fish cubes. Fill a skillet with some oil and heat until hot. Add in pine nuts and fry until they are golden. Remove and drain. Heat the oil in the same skillet to about 110C/230F. Lower the marinated fish cubes into the skillet and stir gently. As soon as all the fish cubes have seperated, remove them with a slotted ladel and drain. Leave 2 teaspoons of oil in the skillet and heat up. Add in chopped spring onions and stir briefly. Stir in diced sweet peppers, and then the rice wine, salt, fish cubes, diced cucumber and pine nuts, stirring gently. Add in the cornstarch-water mixture. Stir until well combined. Drizzle sesame oil over and stir until blended. High in carbohydrates, saturated fats and cholesterol!!! What a　freaking Calorie Bomb! Well....In spite the fact, that Bo Lo Baau is always loved and enjoyed by many many Chinese. It is known in Cantonese as BO LO BAAU, in which "BO LO" means "pineapple", and "BAAU" refers to bun, either with or without stuffing. The pineapple bun contains no pinepple at all, it's a sweet bun topped with a sugary checked crust. Dissolve sugar with warm milk in a mixing bowl. Sprinkle dry yeast over and let proof for about 10 minutes. Add in bread flour and egg. Stir at low speed until a rough dough ball formed. Stir in salt and butter until evenly dispersed. Increase the speed to medium and knead the dough until a soft and elastic dough has formed. The dough should pass the windowpane test. (stretching the dough to see if it thins out). Turn onto floured surface and knead briefly, then form into a dough ball. Place it in lightly greased bowl. Cover with a plastic wrap and place the whole container in a warm bath (35C/95F) 45 minutes, until nearly double in size. Coat one of your fingers with flour, then press it gently into the center of risen dough to the bottom. If the indentation remains, the dough is ready. 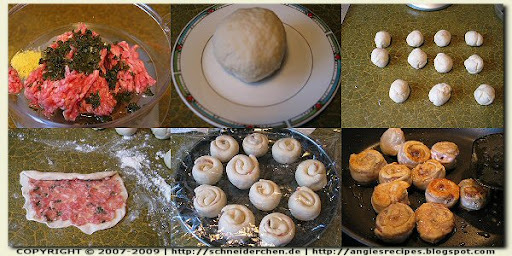 Punch down the dough and divide into 9 equal pieces, roll each piece into a ball. Cover with a plastic wrap and let rest for 10 minutes. Flatten each dough, with the seam side down. Turn and wrap in poppy fillings. Place them on a baking tray lined with parchment paper. Cover and let rise for about 35 minutes. Preheat the oven to 200C/400F. At the meantime, combine together sugar, baking ammonia and baking soda in a bowl. Sift in the flour and milk powder. Add in the rest of ingredients and mix till all incorporated. On a plastic wrap, flatten each pineapple topping to round, about the size of each dough bun. 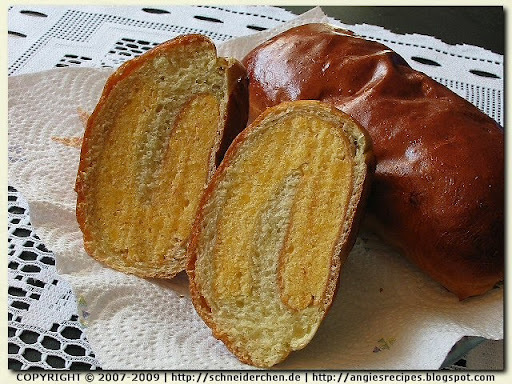 Place them on the dough bun and lightly score with a toothpick to create checked surface, which resembles a pineapple. Brush on egg wash and bake at 200C/400F for about 16 minutes on middle rack. There are four primary polyphenols in green tea and they are often collectively referred to as catechins. Powerful antioxidants, catechins have been shown in recent studies to fight viruses, slow aging, and have a beneficial effect on health. Clinical tests have shown that catechins destroy free radicals and have far-reaching positive effects on the entire body. Free radicals are highly reactive molecules and fragments of molecules that can damage the body at the cellular level leaving the body susceptible to cancer, heart disease and other degenerative diseases. To prepare the bread dough. Sift together the flour, tea powder, sugar, salt and instant dry yeast in a mixing bowl. Add in egg, honey, milk and the starter. Mix with dough hook at slow speed for 1 minute. Increase the speed to the medium and continue to knead until a dough forms. Adjust the speed to slow and cut in butter. Stir until all incorporated. Increase the speed to medium again and knead until the gluten has developed, i. e. elastic, smooth, non-sticky and leave from sides of mixing bowl. 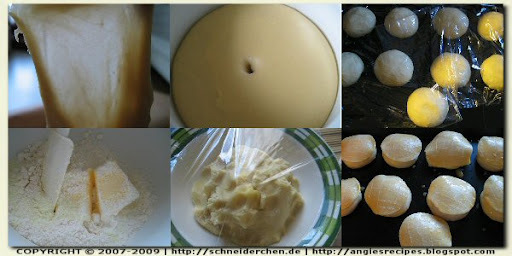 Prove the dough in a lightly greased plastic bag for 1 hour, leave in a warm place until dough doubles in volume. Punch the dough down to release gases produced in the fermenting process. Divide them into 4 portions and round up. Rest, covered, for 15 minutes at the room temperature. To prepare the chiffon cake. Beat the egg yolk with sugar until the sugar completely dissolved. In another bowl, stir together the milk, oil, and vanilla extract. Warm the mixture to 35C/95F. Add into the egg yolk mixture. Sift the cake flour and baking powder into the liquid mixture. Whip the egg whites on high speed until foamy. Add the white vinegar and continue beating until soft peaks form. Beat in the sugar and beat until stiff peaks form. Gently fold 1/3 of the whites into the batter to lighten it, and then fold in the rest of the whites. 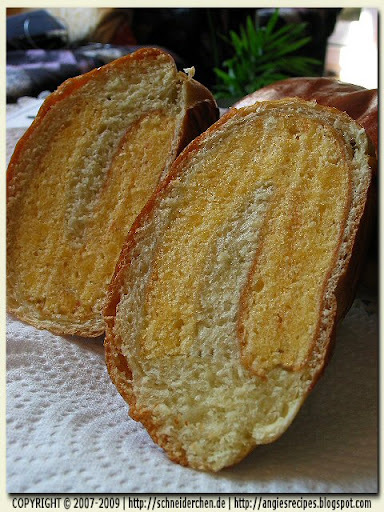 Pour the batter into 2 Swiss roll pan each lined with a baking sheet, spreading the cake batter with an offset spatula. Bake in a preheated oven 165C/340F for 10-12 minutes until gold brown. A toothpick inserted in the center will come out clean and the cake, when lightly pressed, will spring back. Immediately upon removing the cake from the oven carefully remove the parchment paper. If the baking paper sticks to the cake, lightly brush the back of the paper with a little warm water, allow to stand for a few moments, then peel the paper from the cake. Each cut into half and set aside. 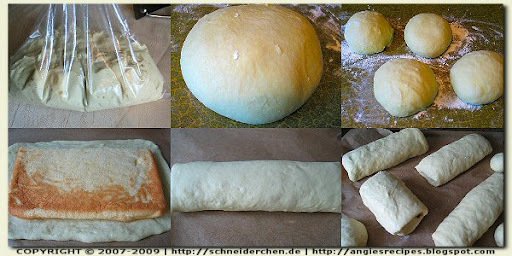 Roll the each bread dough out with a rolling pin to about 15 x 12 cm. Set the cake atop the dough and roll up from a short side. Place them on the baking pan lined with a baking sheet. Cover with a wet towel and leave to rise for about 1 hour until doubled in bulk. Preheat oven to 175C/350F and bake the bread for 20-25 minutes. Soak dried shrimps in water for about 10 minutes. Drain. Devine and finely chop the shelled shrimps. 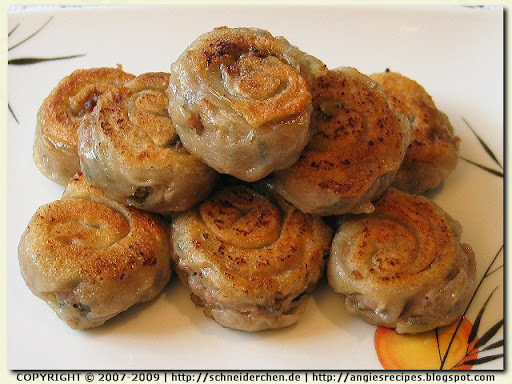 Then mix in the dried shrimps and ground meat. Chop until the whole mixture is fully incorporated. Add in sugar, salt, white pepper and cornstarch and stir vigorously until the mixture is elastic. Lightly dust the inside of bell pepper wedges with cornstarch. Fill each pepper wedge with the mixture, mounding slightly. Pat the top with a bit cornstarch. Heat up a skillet with some oil. 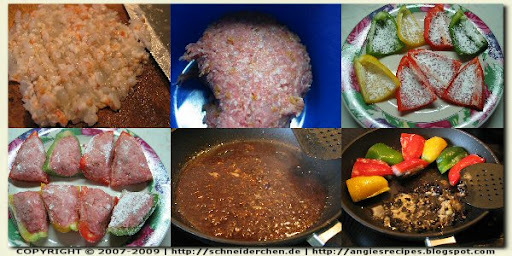 Place the stuffed pepper wedges, filling upside down, in the skillet and pan-fry for about 3-5 minutes. Gently shovel the bell peppers to the sides. Leave half tablespoon of oil to stir-fry ginger, garlic and black beans until fragrant. Pour in water, season with salt and sugar and cover to simmer for 5-8 minutes. Arrange the peppers on a serving dish and thicken the sauce with the starchy solution. Spoon over the stuffed bell peppers and serve. Pan-Fried Stuffed Bell Peppers "Can't find a Recipe? Check out Reader's Digest Canada." 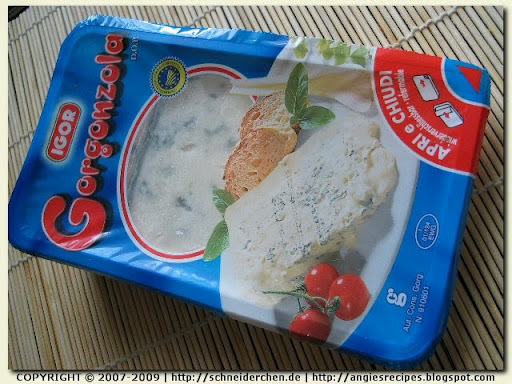 Gorgonzola is a veined Italian blue cheese, made from unskimmed cow's and/or goat's milk. It can be buttery or firm, crumbly and quite salty, with a 'bite' from its blue veining. It has been made since the early Middle Ages, but became marbled with greenish-blue mold only in the eleventh century. It is frequently used in Italian cooking. 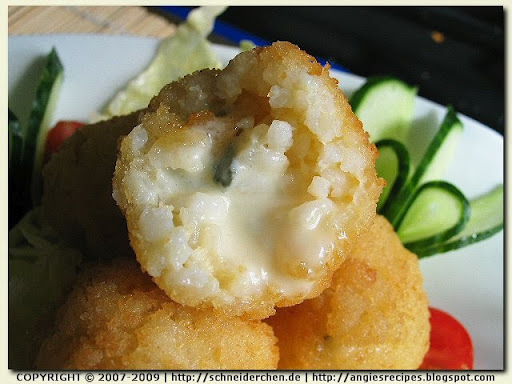 The name comes from Gorgonzola, a small town near Milan, Italy. Beat eggs lightly with chopsticks until they are just combined. 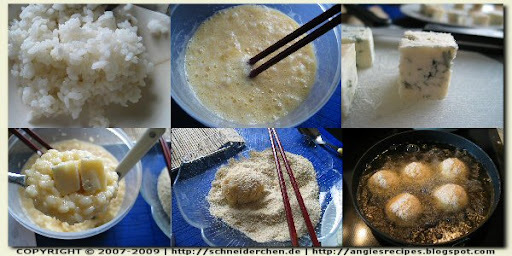 Gently stir in rice until thoroughly incorporated, taking care not to mash the rice. Dice the Gorgonzola. 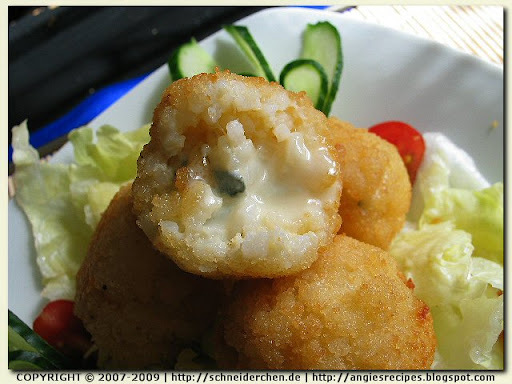 Scoop up 1 soupspoon of the rice mixture, place a cube of Gorgonzola in the center and top with another spoon of rice. Form into a ball with your hands and roll them in bread crumbs. Refrigerate them for 30 minutes. Heat the oil in a deep pan until hot. Fry the rice balls 5 at a time, about 5 minutes until they've turn golden brown. Serve immediately on a bed of salad. In Chinese tea culture, semi-oxidised oolong teas are collectively grouped as qīngchá (Chinese: 清茶; literally "clear tea"). Oolong has a taste more akin to green tea than to black tea: it has neither the rosy, sweet aroma of black tea nor the stridently grassy vegetal notes that typify green tea. It is commonly brewed to be strong, with the bitterness leaving a sweet aftertaste. Several subvarieties of oolong, including those produced in the Wuyi Mountains of northern Fujian and in the central mountains of Taiwan, are among the most famous Chinese teas. Brew a cup of Oolong tea with 5 grams of tea leaves. Reserve 40 ml tea drink and 2/3 tablespoon of brewed tea leaves. Set aside for later use. 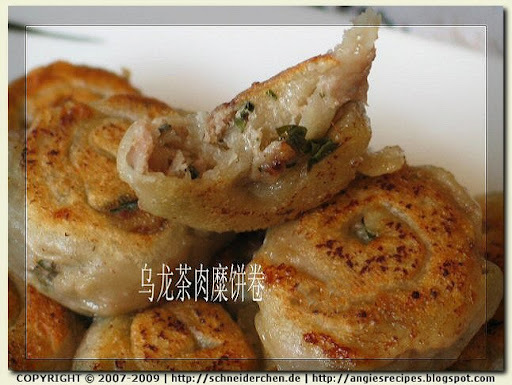 Chop the tea leaves very fine and mix with the ingredients for the filling. Cover and store in the fridge. 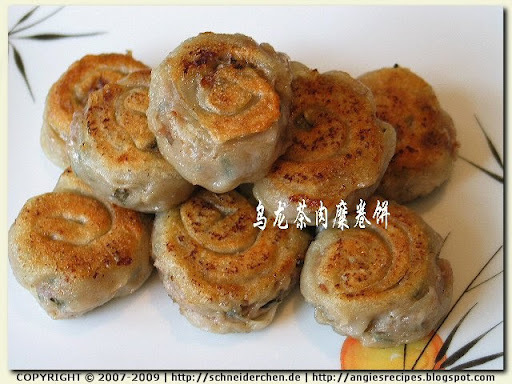 Sift the flour in a mixing bowl, pour in the boiled Oolong tea (use a microwave to warm up if it is cold), use the chopsticks to stir, then add 25 ml cold water in 2-3 times until a smooth and soft (like your earlobe) dough forms. Cover with a plastic wrapper and let stand for 30 minutes. Portion the dough into 10-11, each about 16 grams.Place the portioned dough on a lightly floured board, press flat and roll out thinly with a rolling pin, place a tablespoon of filling on it, roll up and form into a roll like a pencil. Again roll it into a circle about 3-4 cm in diameter. Let stand for 30 minutes. Heat a frying-pan wok over a medium flame. Put the pancake into the pan and cook it until golden brown at the both sides.